Save 30 percent on over 50 varieties of ice-cream, the best burgers and lobster rolls in the valley and everything else on Janine's extensive menu! Use one certificate per order. No cash back. Hours of Operation 11am to 9 pm every day. 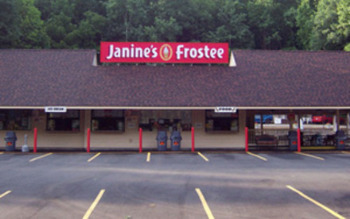 At Janine’s Frostee we serve quality fresh foods and ice cream daily and have been a local family favorite since 1956. We offer a full line of fresh seafood served daily, which is available fried or baked. We have been told that we have the “Best Lobster Roll Around” by many of our patrons. A variety of made to order salads, sandwiches, grinders and wraps are also a favorite! But if its ice cream you are looking for we offer over 50 flavors of Gifford’s, Blake’s, & Bliss Premium hard ice cream and of course our delicious creamy soft serve flavors too!